Conductive graphite paint, primarily designed for SEM sample preparation. The graphite flakes, with an average size of 1µm, are bonded by a cellulose resin with isopropanol as diluent. Good bonding properties on most materials. Graphite content is 20%. Ideal to mount samples on sample stubs or to make a conductive path to the sample surface. Let fully dry before using in the SEM. Maximum service temperature: 200° C. Use Graphite Paint Extender to dilute when needed. 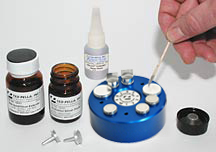 Provides conductivity for SEM non-conductive samples which require grounding. DAG-T-502 is a combination of specially processed carbon particles in a fluoroelastomer resin system providing good conductivity. This carbon cement remains flexible over a temperature range of -40°C to 260°C and cures at room temperature. 502 resists oxidation and has good adhesion qualities. The diluent is methyl ethyl ketone (MEK) and has fluid consistency. Acetone (#16023) can be used as a thinner/extender or as a cleaner. Solids content is 12.6%. Service temperature range is -40°C to 260°C. The specimen mount surface should be clean and dry before application. Keep the container tightly capped when not in use and avoid breathing the vapor. 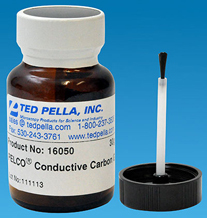 Conductive carbon glue with an acrylic binder. The acrylic binder provides a much stronger bond than water or isopropanol based carbon paints. This carbon glue forms a thin, conductive and flexible layer with excellent adhesion on a wide variety of substrates. Ideally suited for conductive bonding or conductive painting where a strong bond and good conductivity is required. Let air dry or speed up heating up to max. 65°C (149°F). Supplied in a bottle with a brush, 30g. Acetone (#16023) can be used as thinner/extender or as a cleaner to remove the carbon glue. Specific Gravity = 2.25 g/cc. Air drying silver paint to make effective ground. Curable at room temperature and has high adhesion to any material. Surfaces do not have to be prepared prior to application and will adhere to such materials as polymer (phenolic) boards, ceramic, glass, metal, plastic and fiberglass. It should be mixed well with a spatula before using. RoHS compliant. The container is offered in two sizes (15g and 30g) and is provided with an applicator brush. Silver flake grain size is an average of 80%, <1.0µm. Sheet resistance is 0.02 ohms per square @ 1 mil (0.001” = 0.025mm) thickness and is a function of the coating. Service temperature range is -40°C to 200°C. Use #16021 gold/silver thinner/extender to dilute when needed. Leitsilber is fast drying and has a flat surface texture. Silver content 45%, Resistance: 0.02 - 0.04ohms/square. Drying time ~10 minutes at 20°C. Application can be by brush, dipping or spraying. Acetone (#16023) can be used an extender/thinner or as a cleaner to remove the silver paint. 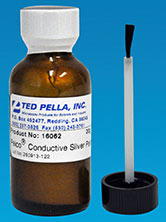 A highly conductive silver paint with an acrylic binder. High purity silver flakes, fast drying with a low VOC content. 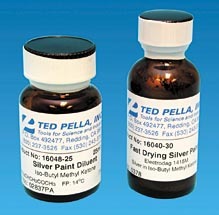 The fast drying silver paint forms a thin, highly conductive and flexible layer. Ideally suited to form conductive paths or conductive bonding for SEM sample preparation. Durable acrylic resin minimizes metallic loss, flakes ensure maximum conductivity. Other applications are conductive paths for electronic components and EMI/RFI shielding. Excellent adhesion to most nonconductive materials such as plastics, ceramics, wood, glass, epoxies and most metals. Supplied in a 30g bottle with brush or 15g bottle without brush. Acetone (#16023) can be used as thinner/extender or as a cleaner. 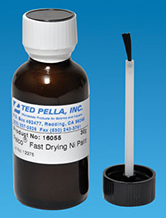 Ideal where a nonflowing paste is needed for special applications. Particle size: 0.4-1.0µm, 80% are below 1.0µm. Cures in 16-20 hours, or 30 minutes @125-150°C. Clear lacquer base. Approximate Specific Gravity 2.25g/cc3. Service temperature = 200°C. Use #16021 gold/silver thinner/extender to dilute if needed. This very fine flake silver is suspended in iso-butyl methyl ketone (4-methylpentan-2-one) and forms a thin, smooth, highly conductive silver film which is both adherent and flexible. 30g. Fast drying silver suspension has been specifically designed to give increased coverage while maintaining a very high conductivity. Gold paste is fast drying and useful for analytical analysis over time where a high signal is desired. The gold is in microfine form and contains organic binders and a solvent. Dries at room temperature. Not intended for permanent use, but for testing and temporary work. Sheet resistance is .02 to .05 ohm/sq @ 1 mil thickness. Contacts hold down to very low temperatures (<-200°C), but are not permanent since this type of product has low mechanical strength. 75% gold content; sphere size <2µm, flake size <10µm. Maximum service temperature is 65°C. Refrigerate for best life. Bring to room temperature gradually. Approximate calculated specific gravity 3.18g/cm3. The excellent thermal and electrical conductivity, coupled with the absence of hydrocarbons, makes this product ideal for demanding specimen preparation in FESEM, XPS, ESCA, SIMS, Auger and other applications. 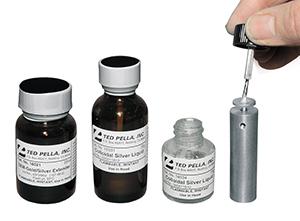 PELCO® High Performance Silver Paste provides both high electrical and thermal conductivity with a silver particle size of 20µm. Silver content >60% by weight. Cures at room temperature, but requires a 2 hour cure at 93°C (200°F) to achieve high conductivity and strong bond. Must be fully cured before using this product at cryogenic temperatures. Soluble in water to 260°C (500°F). Above this temperature it becomes almost insoluble. For nonconductive, high temperature adhesive try Product #16026. Carbon flakes in an inorganic silicate solution for bonding resisting up to 2000°C. 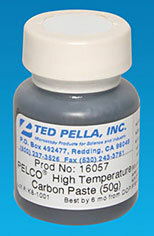 The PELCO® High Temperature Carbon Paste is aimed for applications where a conductive cement is needed which withstand temperatures up to 2000°C (3632°F).This paste is ideally suited for mounting specimens on hot stages for SEM , FESEM, XPS, ESCA, SIMS and AUGER systems. Also for applications where silver migration or a reaction with silver or nickel flakes could be a problem, this product would be an excellent alternative. Carbon content is 50-60% by weight in an inorganic silicate aqueous solution. Conductivity in cured state is 4.6 ohm/square/mil. Must be fully cured to achieve good conductivity and strong bond. Soluble in water to 260°C (500°F). Cure schedule is: air dry at room temperature for 2-4 hours, step cure at 93°C (200°F) and final cure at 260°C (500°F). The good thermal and electrical conductivity of this adhesive, coupled with the absence of hydrocarbons, makes this product suitable for demanding specimen preparation in surface science and SEM applications. Nickel particle size is 20µm, nickel content is >60%. 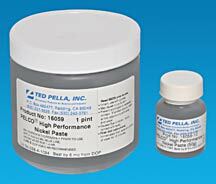 The PELCO® High Performance Nickel Paste needs to be cured for 2 hours at 93°C (200°F) to achieve final electrical and mechanical properties. It is soluble in water to 260°C (500°F), above this temperature it becomes almost insoluble. 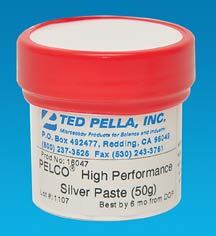 For more demanding applications, try PELCO® High Performance Silver Paste. Conductive nickel paint with an acrylic binder. High purity nickel flakes (8-13µm), fast drying with a VOC content of 27.5%. The fast drying nickel paint forms a thin, conductive and flexible layer with good adhesion on most substrates. 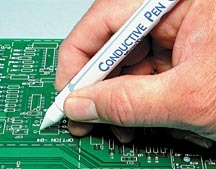 Can be used to form conductive paths, conductive bonding or conductive painting where silver can't be tolerated, but where high conductivity is required. The conductivity of this nickel cement paint is approximately 20x better than graphite paint and approximately 10% of silver paint. The high oxidation resistance of pure Nickel ensures a long-term conductivity. Nickel is a magnetic material, not suitable for high resolution SEM imaging close to the pole piece in most SEMs. Supplied in a bottle with a brush, 30g. Acetone (#16023) can be used as thinner/extender or as a cleaner to remove the nickel paint. Leit-C-Plast is a conductive adhesive paste that can be molded to provide conductive paths to larger non-conductive samples when mounted on a specimen holder for SEM studies. The plasticity is permanent. It is not affected by high vacuum conditions and shows no peaks in energy dispersive X-ray microanalysis. Heavy specimens may also be prepared for viewing in a SEM using Tempfix (or the Glue Gun - see details in our non-conductive section) and Leit-C-Plast. First the specimen is fixed into place with Tempfix or the Glue Gun. Afterward, an electrically conductive bridge is made between specimen mount and specimen using Leit-C-Plast. It is not required to wait for drying because neither adhesive outgasses. Leit-C-Plast was originally developed for holding specimens on angled specimen holders. The adhesive is offered in a roll form and is black. Flat plates are provided for working the material. May be applied with a spatula. 100% solids, two component silver filled epoxy with a soft, smooth, thixotropic (becoming less viscous when stirred or shaken) consistency designed specifically for chip bonding in microelectronic and optoelectronic applications. Excellent handling characteristics, extremely long pot life at room temperature for this electrically conductive silver adhesive. High speed epoxy chip bonding systems are suitable for very fast cures, such as fast circuit repairs. Can be screen printed, machine dispersed or stamped and can withstand wire bonding temperatures in the range of 300 - 400°C. 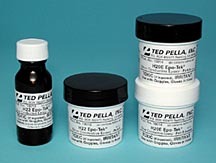 Two component, silver-filled epoxy system, consisting of a silver resin paste and a liquid hardener (100:4.5). It is a free flowing paste, 100% solids system characterized by outstanding high temperature properties as well as excellent solvent, chemical and moisture resistance. It has a long pot life and is fast curing at relatively low temperatures. Containing no solvents or thinners; it will not outgas. It can be applied by brush, spatula or hypodermic needle. H-22 can be useful for small angle cleavage in material science and semi-conductor applications. EPO-TEK® silver content is 60% by weight of composition. NASA approved  passes NASA low outgassing standard ASTM E595 with proper cure. Ref: http://outgassing.nasa.gov. Note: Mixing ratio for this product is 100 parts silver resin paste to 4.5 parts liquid hardener. Two component, silver filled, epoxy system consisting of a silver resin paste and a silver resin hardener (1:1). It is a smooth, thixotropic paste, 100% solids system characterized by outstanding high temperature properties and excellent solvent, chemical and moisture resistance. It has a long pot life and is fast curing at relatively low temperatures. Will withstand 200°C for 1,000 hours. Containing no solvents or thinners, it will not outgas. H20E is ideal for electronic applications. Cures rapidly. Easy to use; the pure silver powder is dispersed in both the resin and the hardener so that it can be used in a convenient 1:1 mixing ratio. Non-toxic  complies with USP Class VI Biocompatibility standards. Strong, highly conductive epoxy for solderless connections and repairs of circuit boards, static discharge shielding, grounding and conductive paths. 65 to 121°C (150 to 250°F) for 5 to 10 min. Draws highly conductive silver traces, jumpers and shielding with high precision. This conductive silver grease provides antistatic conductivity paired with excellent thermal conductivity between sliding surfaces. At the same time it provides protection from corrosion and moisture and reduces mechanical wear. Exhibits excellent lubrication properties and superb chemical resistance. Typical applications include lubrication of vacuum transfer rods (airlock on SEM), static grounding on seals or O-rings, heat dissipation and lubrication of switches and circuit breakers. Paste like consistency. Service temperature range is -50°C to 200°C (-58°F to 392°F). Packaging size is 7 grams in a syringe for easy application.